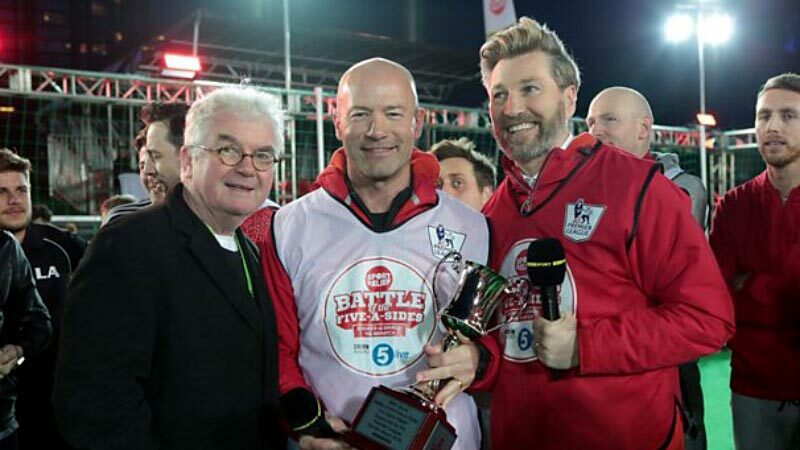 Alan Shearer is the champion of the epic BBC 5 live Battle of the Five-A-Sides for Sport Relief, supported by the Premier League. The final whistle was blown after 57 hours of continuous five-a-side football that was played at dock10 in Salford's MediaCityUK. Alan and Robbie went head to head once again, following Alan's win in the Battle Of The Backsides for Sport Relief 2014. This time round the footballing legends were also joined by Danny Jones, Rachel Riley and Josh Cuthbert, with all five stars each playing 12 hours straight of continuous football through the wind, rain and snow. Sport Relief's biggest ever five-a-side football match not only saw Alan and Robbie return to the pitch to play, but also take their place in the dugout to manage a squad of players throughout the three days. Alongside the five stars, over 1,100 players took part in 30 minute games, as part of Team Shearer or Team Savage, to make up 57 hours of continuous football - the equivalent of playing an entire Premier League season for one club. Robbie was representing BBC Radio 5 live, while Alan was taking part on behalf of BBC's Match Of The Day. They were also joined by a rolling cast of well-known names from the world of sport and entertainment including John Bishop, Angus Deayton, Hugh Dennis, and Fatman Scoop, who was sent off with a red card by honorary referee, Manchester United's Adnan Januzaj. Alan Shearer was also presented his winning trophy by fellow football legend Gary Lineker earlier this evening.